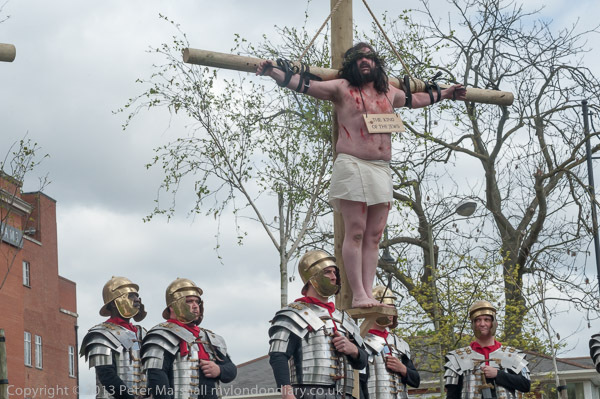 I had been asked if I would take some photographs of the Staines Passion play, which was being put on with a large cast of volunteer actors by Churches Together in Staines on Holy Saturday, and agreed to do so. 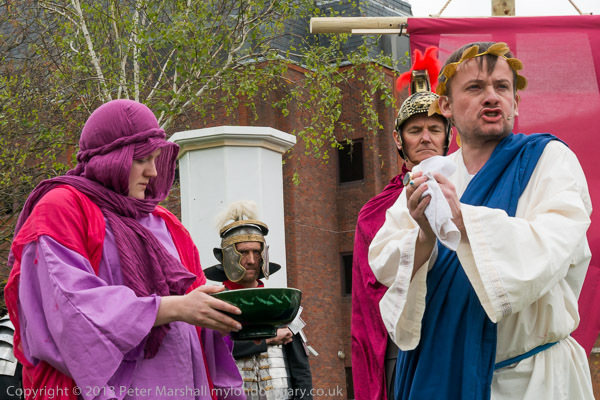 Four years ago I’d photographed the ‘Passion of Jesus‘ performed on by the players from Wintershall on Good Friday in Trafalgar Square, so I had a good idea of what to expect,as this was based on their version of the gospel stories. There were two major differences between this and Trafalgar Square. 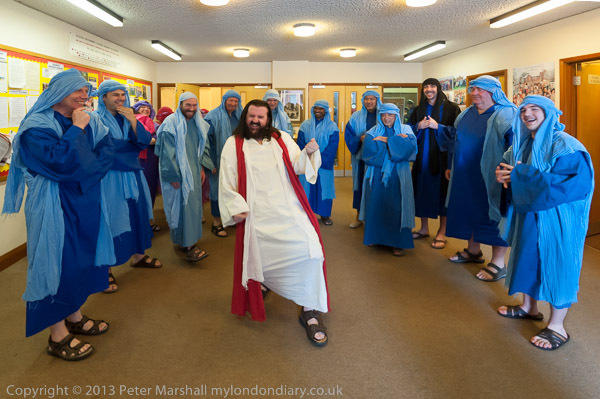 One was of course the venue, and the other the scale of the event, with a few of the scenes being rather reduced, but the story was the same, roughly following the gospel versions at least until the final scene after the discovery of the empty tomb, where the gospel stories perhaps get too diffuse to make good theatre. The gardens themselves were given a makeover that more or less lost any atmosphere they once had, though it was a real shame that the rather gloomy bandstand was so seldom used. There are a couple of mildly interesting entrance arches (they have been compared to the crossed swords of the Arc of Triumph in Baghdad and the whalebone arches of Whitby and elsewhere) and a replica of the London Stone, replaced not far from its original position after a long period hidden in a park half a mile up river, but otherwise are rather a disaster. In particular their is a long strip of ‘water feature’, a narrow stone ditch that most people only notice when it trips them up and local wags occasionally fill with detergent. Hard to think why this was thought a good idea when there is a much larger water feature – the River Thames – running alongside the gardens, and a few months ago threatening to engulf them. The car park did get flooded, by an own goal, with water being pumped from the Thames by the council to feed Sweep’s Ditch fortunately failing to do so as the outlet got blocked by flood debris. The few small artificial lumps in the grass and some small areas of planting made it possible to adapt one edge of the grass to serve as three or four different areas for the performance, with a large open grass area for seating in front of them. For most of the audience, sitting on the grass, there was a good view except for one area, which was largely obscured by others in the audience standing at that side. 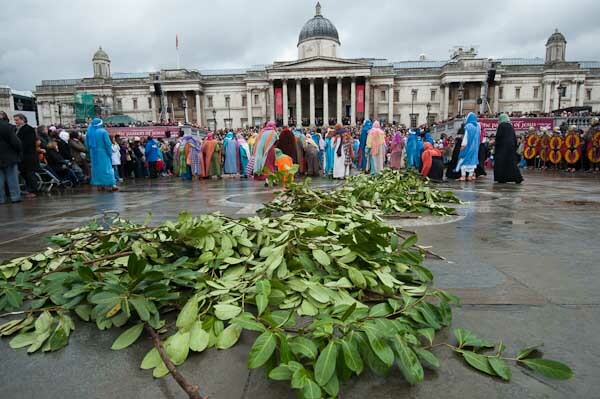 But most will have seen rather more of what was happening than in the Trafalgar Square performance. 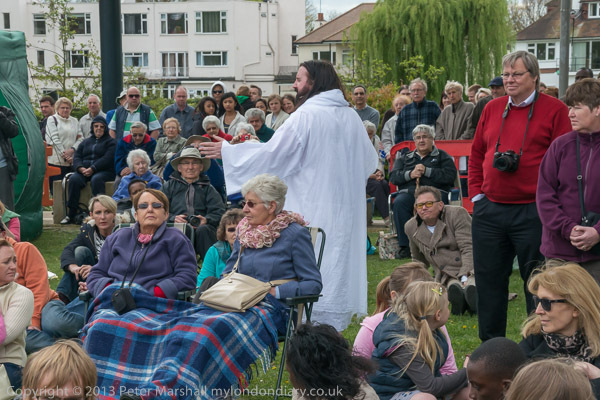 The sound too, was rather better than in Trafalgar Square (though things may have improved since 2010) but the row of speakers at regular intervals along the front of the audience seated on the grass did sometimes rather get in the way when taking photographs. It was rather tricky to get to the right place at the right time through the performance, as the action moved from one side to the other. There were just a few things I missed completely, or didn’t quite manage to photograph as I would have liked. I could have come back and taken more at the second performance, but instead I went home to sort the pictures out. 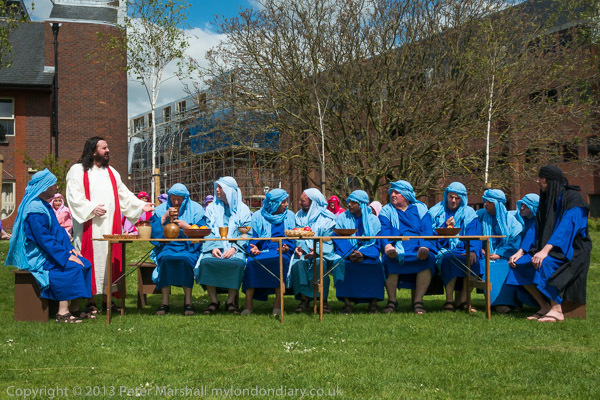 There are other similar performances elsewhere – and Wintershall themselves were putting on a performance in Guildford High St at the same time as that in Staines, which moves along the High St among the shoppers as well as those who have come specifically to watch. 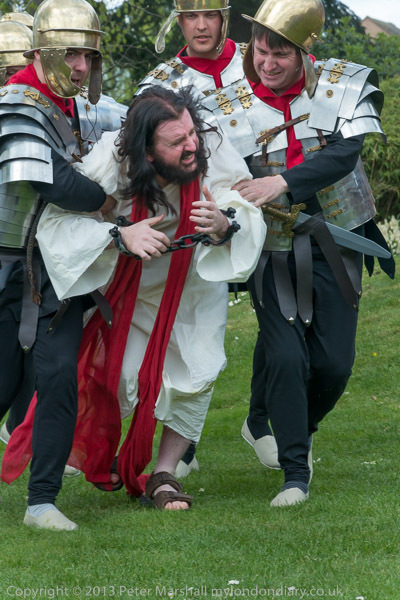 The Staines Passion is expected to take place in later years and may perhaps evolve, but it seemed to get off to a very successful start. This entry was posted on Monday, May 26th, 2014 at 04:37 pm and is filed under My Own Work. You can follow any responses to this entry through the RSS 2.0 feed. You can leave a response, or trackback from your own site.